Glove manufacturers are continuously looking for new and ingenious combinations of materials to achieve the greatest protection possible, while still allowing the wearer enough dexterity to perform the intended activity. SATRA’s Mike Cooper outlines the issues. Hands are an important part of our anatomy and are vital for virtually every activity in which we are involved, from driving a car to cooking a meal. The uses to which we put our hands mean that they are frequently exposed to the risk of injury, however. Furthermore, as one of the extremities of the body, hands are also particularly vulnerable to hostile environments such as cold climates. It can be difficult or impossible to remove the hazard and, therefore, it is often more practical to provide some form of hand protection. This has resulted in a billion dollar global industry manufacturing and supplying a wide variety of protective gloves and mitts. With an estimated 75 percent of all protective gloves produced in the world made for export, the manufacture and supply of protective gloves is a global business, and a fiercely competitive one. The market for protective gloves has benefitted from the growing worldwide body of legislation intended to ensure that workers’ health and safety are not compromised. It is estimated that the annual worldwide market for protective gloves is now in excess of 90 billion pairs. Disposable medical gloves represent the largest sector of the market by volume - accounting for around 85 percent of protective gloves sold. Because of their relatively low unit cost, however, medical gloves’ share of the market drops considerably. In contrast, low volume products, which are complicated to manufacture - such as fire fighters’ gloves - command significantly higher prices in the marketplace, enabling many niche manufacturers to operate. Most industrialised nations have introduced regulations relating to occupational health and safety and many have established standards covering personal protective equipment (PPE), including protective gloves. The European Union has introduced a series of directives aimed at improving health and safety at work and providing for high quality PPE. These, together with restrictions on the use of many substances on health and environmental grounds, mean that the European Union arguably provides one of the greatest challenges to those in the protective gloves’ market - but also one of the greatest opportunities for those who can get it right. One of the keys to success in the European market is an appreciation of the various European standards that cover protective gloves, while another is understanding the obligations imposed by the European PPE Directive 89/686/EEC. While there are many standards covering specific glove types, this article focuses primarily on a number of the main standards published by the European Committee for Standardization (CEN). These standards have a unique status as they are also national standards in each of the 27 Member countries of the European Union. With one common standard in all these countries and every conflicting national standard withdrawn, a product can reach a far wider market with much lower development and testing costs. CEN standards for protective gloves The number of CEN standards covering protective gloves is well into double figures. Two of these are of particular importance because they are called up in so many of the other standards. The two in question are EN 420:2003+A1:2009, Protective gloves - General requirements and test methods and EN 388:2003, Protective gloves against mechanical risks. These may be regarded as foundation stones for the European standards for protective gloves. This standard is designed to ensure that the gloves themselves do not cause harm to the wearer and are comfortable to wear. Tests and requirements include the pH value and chrome VI content of leather, plus water vapour transmission and absorption of materials. Also, procedures to examine the sizing of the glove and its effect on finger dexterity are covered, plus general requirements for the information to be supplied with and marked on the glove. The length of the glove is measured by suspending it from the middle finger with a graduated rule having a rounded tip designed to fit the tip of the finger (see Figure 1). The glove is manipulated to remove any wrinkles or folds and the minimum length is recorded. EN 420 includes a list of minimum lengths for each glove size; however, gloves for special purpose are permitted to be below the minimum length, although in such situations the manufacturer must demonstrate that they are fit for special purpose by a statement in the user instructions. Gloves are fitted on a hand of the size that they are intended to fit and comments are made regarding comfort and fit. The wearer will then try to pick up pins of varying size to provide an indication of dexterity. Five pins are defined from 5mm to 11mm in diameter; clearly, the smaller the diameter that can be picked up the greater the dexterity result (see Figure 2). The determination of pH value of both leathers and textiles on a glove is required. This pH value should be greater than 3.5 and less than 9.5. The test samples are taken from the palm of the glove. If other parts of the glove contain different material, these materials are tested separately. A prepared test sample is extracted in water by mechanical shaking; the aqueous extract is then decanted and the pH value determined by a pH meter (see Figure 3). An excessive amount of acid or alkali in a material has been linked to skin dermatitis and may indicate poor process control. Each type of leather on a glove is tested separately and must comply with the requirement of less than 3mg/kg of chromium VI - a restricted substance and known allergen. Two samples require testing from each leather type; these two samples should be taken from different gloves. The soluble chromium VI is leached from the leather in a phosphate buffer. The chromium VI in the extract is then oxidised to produce a red/violet colour; this can then be quantified by a UV spectrophotometer. The glove marking or labelling should contain specific pictograms which, in conjunction with name, trade mark of the manufacturer, style reference or code, should include the numerical size which the standard requires to be legible and indelible for the foreseeable life of the product. Some products - due to the material characteristics such as thin latex - cannot be marked as they may be damaged during the marking process; EN 420 allows the marking to be placed on the next immediate packaging. Other more specialist gloves, such as chemical or heat resistant gloves, have additional specific requirements but must also satisfy the relevant parts of EN 420 and EN 388. This European Standard is widely used in assessing gloves for general industrial applications. It is also referred to in many of the specialist glove standards for activities such as welding and handling of chemicals. EN 388 was first published in 1994 and subsequently revised in 2003. It includes four main physical tests to assess the resistance of a glove’s palm area to mild abrasion, cutting, tearing and puncture. The performance of the glove is graded in accordance with four or five performance levels. The end user is then able to select a glove with a performance level profile that suits a particular work activity. A glove could be performance level 4 for abrasion but level 1 for tearing, for example - in European standards, the higher the number, the greater the protection. Samples are cut from the palm of a glove and rubbed against a 100 grit abrasive paper using a ‘Martindale’ type abrasion machine. The number of cycles for the samples to hole is measured. Four performance levels are defined in EN 388 ranging from Level 1, where holing occurs between 100 and 500 cycles, to Level 4, where the material survives at least 8,000 cycles without holing occurring. Samples are taken from the palm of a glove and the number of cycles for a circular rotating blade to cut through the full thickness of the test sample is recorded. The test involves the blade moving back and forth over the sample, rotating in the opposite way to the direction of travel, under a fairly light (5N) cutting force (see Figure 4). Blade sharpness will vary and is assessed by using the cut test machine to cut through a standard reference fabric. The cut resistance of the glove is based on a relative index that compares the number of cycles to cut through the glove when compared with the standard fabric. To account for the loss in sharpness over several cutting strokes, the standard canvas is cut before and after the test sample and the average number of the two ‘calibration’ cycles is used as a divider to calculate the performance index. Five performance levels are defined in EN 388 ranging from Level 1, a cut index of at least 1.2 but less than 2.5, to Level 5 a cut index of at least 20.0. These performance levels are recognised by safety professionals and considered a valuable tool in choosing the correct glove, following a risk assessment of the relevant activity. While it is accepted that the EN 388 method, commonly referred to as the ‘Coup test’, is satisfactory for gloves with lower levels of cut resistance, improvements in glove technology have highlighted its deficiency at higher cut levels, due to the rapid blunting of the test blade. Another test - EN ISO 13997:1999 - has become widely used for assessing the cut resistance of higher performing gloves. See Box 1 for details of this standard. The samples are rectangular and are slit to form two legs: for this reason they are commonly known as ‘trouser tear’ specimens. The samples are taken from the palm of a glove and are torn apart using a standard tensile test machine (see Figure 5). Four performance levels are defined in EN 388 ranging from Level 1, a tear resistance of at least 10 N, but less than 25 N, to Level 4, a tear resistance of at least 75 N.
Samples are taken from the palm of a glove and the force required to penetrate the sample with a defined stylus using a tensile test machine is measured (see Figure 6). Four performance levels are defined in EN 388 ranging from Level 1 where the puncture force is at least 20 N, but less than 60 N, to Level 4 where the puncture force is at least 150 N. EN 374 Parts 1 to 3: 2003 European Standard EN 374: 2003 consists of the following parts under the general title: ‘Protective gloves against chemicals and micro-organisms’. • Part 1: Terminology and performance requirements • Part 2: Determination of resistance to penetration • Part 3: Determination of resistance to permeation by chemicals Part 1 details the performance criteria and also includes requirements to check the mechanical and physical integrity of the products. Penetration resistance in Part 2 is determined by subjecting the gloves to either air leak or water leak tests to determine if any holes are present which would allow chemicals to penetrate through to the user’s hand. Part 3 specifies the determination of the resistance of protective glove materials to permeation by potentially hazardous non-gaseous chemicals under the conditions of continuous contact. Permeation is the process by which a chemical moves through a protective glove material on a molecular level. Gloves are classified according to the breakthrough time of the chemical through the glove material. Two tests are included in Part 2 of EN 374, both to assess the resistance of the glove to penetration - or freedom from holes. Firstly, the air leak test is done, which involves inflating a glove with air pressure and then submerging it in a tank of water. Any leaks are identified by visible bubbles. The second test involves suspending a glove filled with water and examining its outer surface for water droplets. A sample of the glove material is placed in contact with a challenge chemical and the rate at which this chemical travels through (permeates) the material is monitored. This is used to determine what is termed the breakthrough time - defined as the time at which the permeation rate exceeds 1µg/cm2/min. The samples are assigned performance levels depending on this breakthrough time. In order to be certified as chemically protective, the gloves must achieve a minimum of level 2 (breakthrough time of greater than 30 minutes) against at least three chemicals listed in EN 374-1. This is a general standard designed to be used for any glove which is to be produced and sold as providing protection against thermal hazards. The standard includes six thermal tests - burning behaviour, contact heat, convective heat and radiant heat, as well as against small and large splashes of molten metal, plus reference to EN 388 and EN 420 for mechanical and general performance requirements. The test(s) selected are based on the intended use of the glove. By their very nature, chainsaws are extremely dangerous machines. The EN 381 series of standards covers how forestry protective clothing should be designed and tested to assess the level of protection afforded against cutting by a hand-held chainsaw. Part 7 of the series is devoted to gloves and in addition to requirements based on the tests of EN 388, the standard includes cut resistance tests - detailed in Part 4 of EN 381, and requirements regarding the area of protective coverage. The standard includes several performance classes based on the linear speed of the chainsaw chain at the start of the cutting test, and the glove’s ability to resist cut-through at that speed, as well as ergonomic requirements based on an EN 381 Part 4 test procedure. The test procedure described in standard EN 381 Part 4 consists of an electrically driven chainsaw running at a controlled speed, dropped onto a test glove which is fitted on an artificial hand. The glove fails if it cuts through before the chain has come to rest. The standard includes several levels that are based on the linear speed of the chain before it impacts the sample - these range from 16 m/s to 28 m/s. 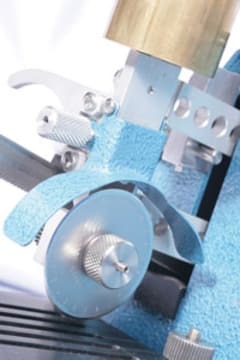 The cutting capability of the chain is calibrated using special reference pads. EN 1082 is a three-part standard. Part 1, published in 1996, was intended for gloves to be used in the meat processing industry and worn by staff carrying out tasks such as cutting flesh from a carcass. These gloves traditionally are made from metal chainmail due to its high cut resistance, and ability to be regularly steam sterilised without significant degradation. For this reason, the testing and requirements in EN 1082-1 are geared specifically for chainmail products. The two further parts of EN 1082 have been added to cover testing of gloves that are made from non-chainmail materials such as fabrics and leathers. Key tests for these products involve dimensional assessments including a test to ensure that probes of defined sizes will not penetrate the glove, an impact cut test to assess the strength and cut resistance of the glove and, for chain mail gloves, a tensile strength test on the rings that make up the chainmail structure. This standard is primarily based on a complex test procedure to assess a glove’s performance in attenuating transmitted vibrations. The glove is worn by an operative with a required hand size. The operative stands on a platform and holds a handle of defined dimensions. The handle is connected to an actuator that is driven by a signal generator and amplifier. The signal generator is set to cause the handle to vibrate while the output from an accelerometer inside the glove is monitored. This gives an indication of the glove’s ability to attenuate vibrations at a defined frequency range. While hand injuries still form a high percentage of accidents both at work and at home, many of them are easily preventable by wearing appropriate protective gloves. Increasing, legislation and obligations on employers and manufacturers to provide safety equipment that provides adequate protection against a variety of hazards means that materials technology is constantly being advanced to provide higher protection. This is resulting in better designed and more comfortable gloves which, if used more widely, should lead to a reduction in injury statistics. SATRA is involved in the development of testing methods through its research division, either by formulating tests in response to customers’ specific requirements, or through pure research into test methods which are not currently available. The grip characteristics of a glove is one area where a lack of real testing or available data was identified. SATRA worked with a leading industrial manufacturer to develop a way of comparing the many types of gloves for their grip when dry, or when contaminated with various substances. Two methods were developed - the ‘Whole Hand Grip’ and the ‘Pinch Grip’ - and testing to both methods is now available at SATRA. With its well equipped laboratories, SATRA offers a comprehensive glove testing and certification service. For a number of the tests, SATRA has the only UKAS (United Kingdom Accreditation Service)-accredited facilities in the UK. Since European Standards were introduced, SATRA technicians have tested thousands of gloves for clients from many parts of the world - many of them in support of EC-type examination, as SATRA is a Notified Body. SATRA has representatives on many of the CEN technical committees and is actively involved with the drafting of the standards and also in the manufacture of the relevant test apparatus. Readers interested in finding out more about current glove standardisation and testing are invited to contact the author Mike Cooper on mikec@satra.co.uk.